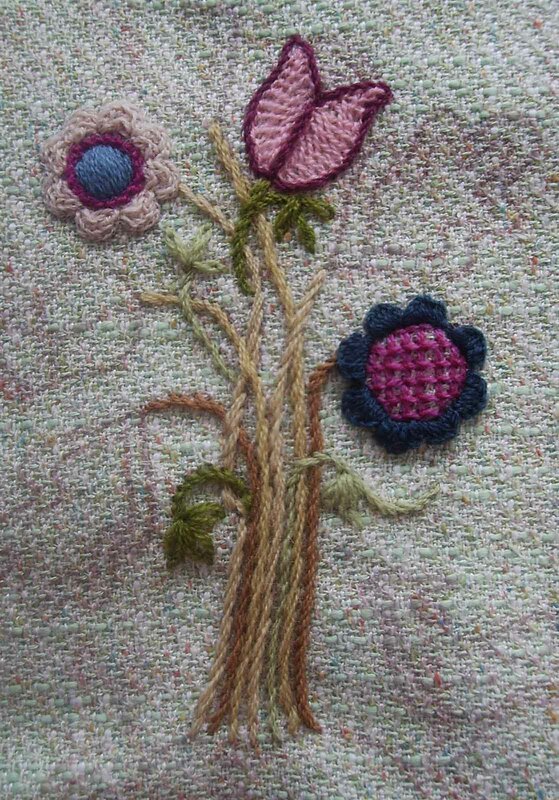 Jacobean style embroidery has been calling to me lately, and I have an affinity for the Tree of Life, so it is only natural for a creation that twines the two together! I still have the wristlets on the creation board too. For embroidery: the dragon is in waiting, a little rose-kid is done and awaiting a face, and two other small purses (not wristlets) are done and just waiting for their embroidered flaps. Lots has been happening! Whoo hoo, this weeks blog posts should be full! Embroidery, sewing, crochet and all designing has been slowed by our attempt to finish off this one bedroom in our remodel. We’ve managed to install two floors in two days and are now working on the finishing ‘bling’ which is definitely tiring and taking all of the creative energy of everyday so far. At night, I sit and peruse my projects and dream up ideas for them, but the actual ‘doing’ of the project has been hindered. 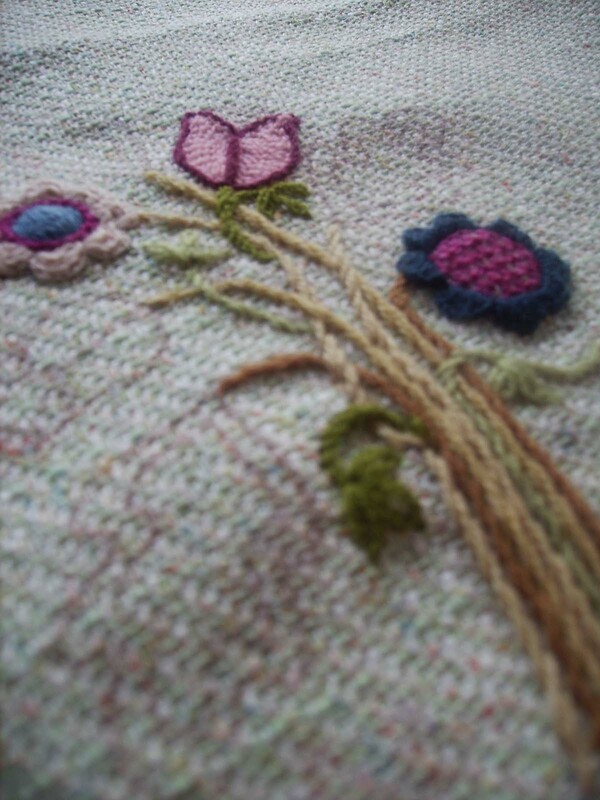 Hopefully, I can get to some embroidery this weekend and have a finished wristlet to post about on Monday! After posting here and questioning Email groups that I am involved with, I did receive several embroidery suggestions for the wristlet fabrics. Thanks for the great ideas! 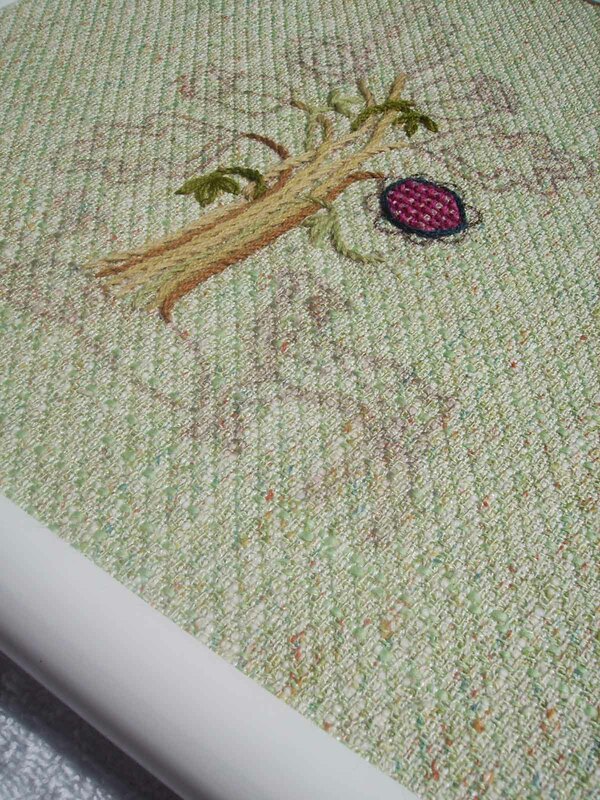 After ironing on a little design of an Elf with a watering can, I just couldn’t bring myself to stitch it. 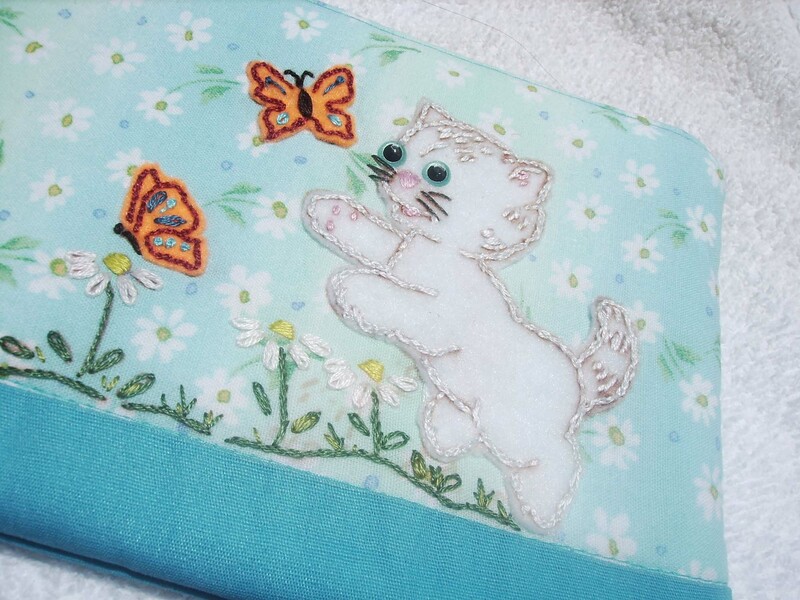 I looked at the blue daisy fabric and kept seeing the little white cat chasing butterflies. (Thanks Raven!) 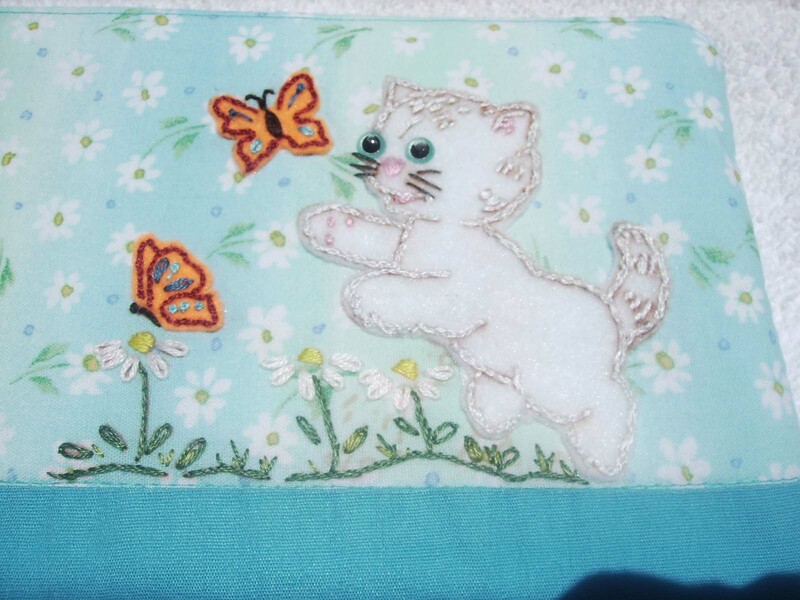 So, I hopped on over to Hoop Love and found the little kitty transfer. It was the basis for the inspiration to alter it just a bit. 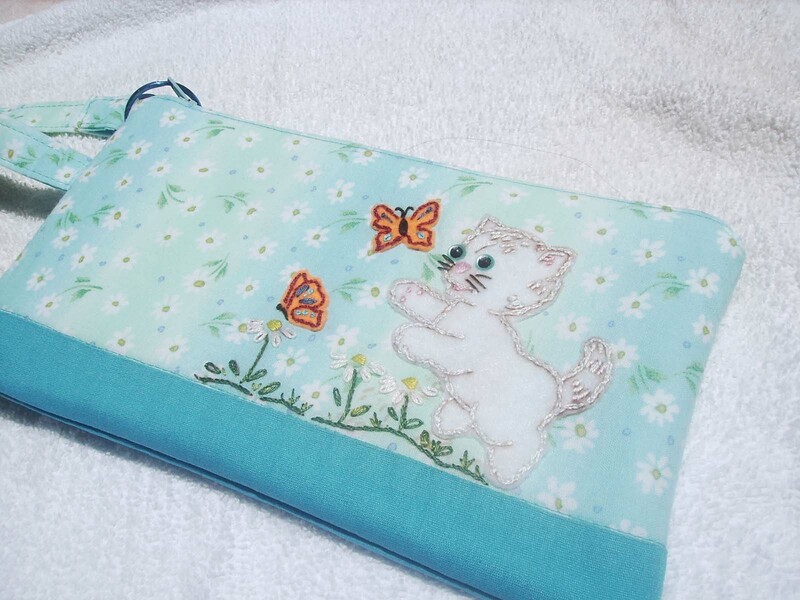 The kitty is originally stitched on white felt then appliqued onto the wristlet. 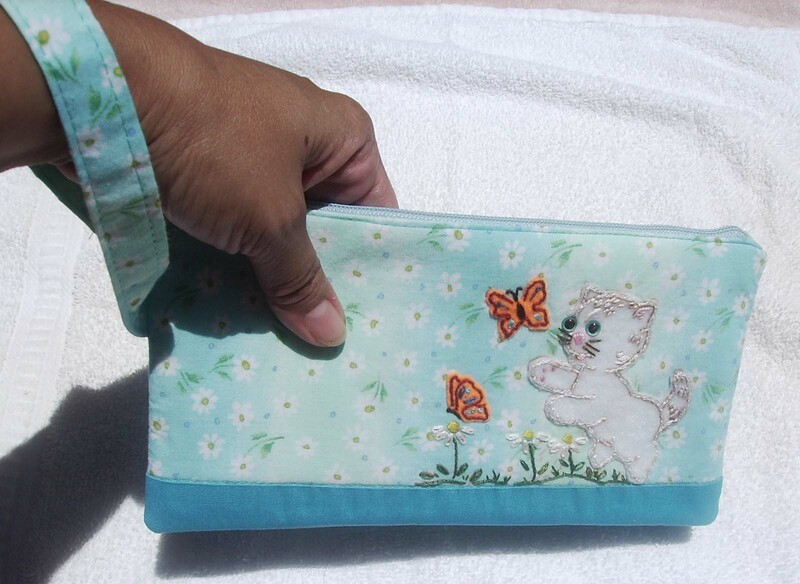 The butterflies are done the same way, stitched on orange felt, cut out, then appliqued onto the wristlet fabric. 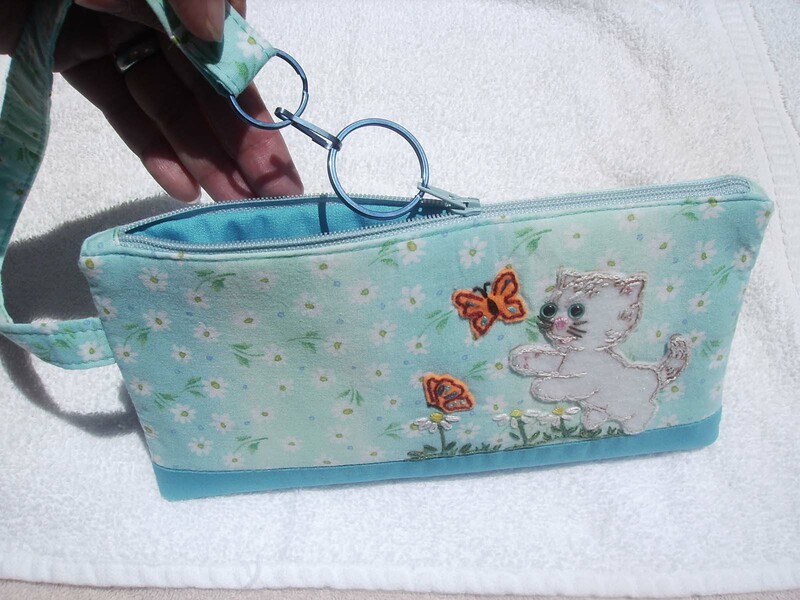 The flowers, grass, leaves and stems are all stitched directly to the wristlet fabric. 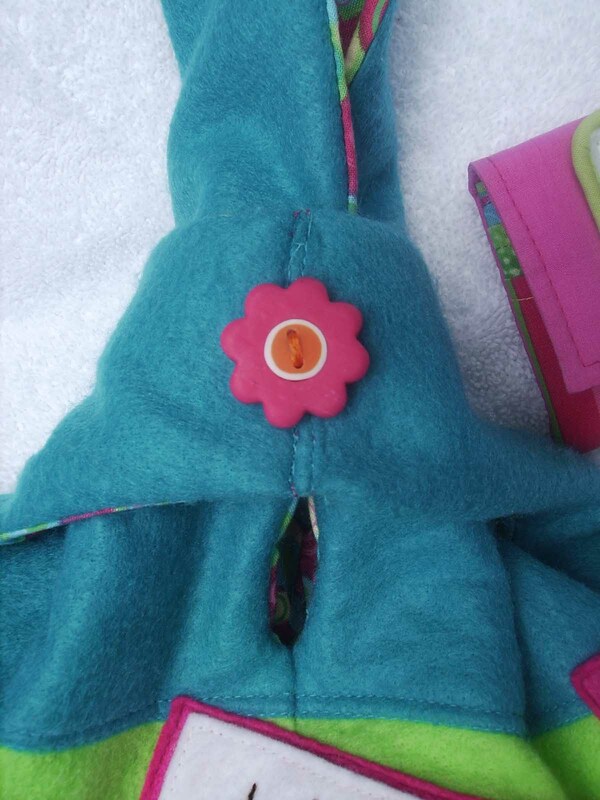 The whiskers and the butterfly bodies are added after applique. I went ahead and used animal eyes for the little eyes instead of chancing the eyes to stitches. I used pearl round eyes because the smallest cat eyes I have are 9mm….WAY TO BIG! 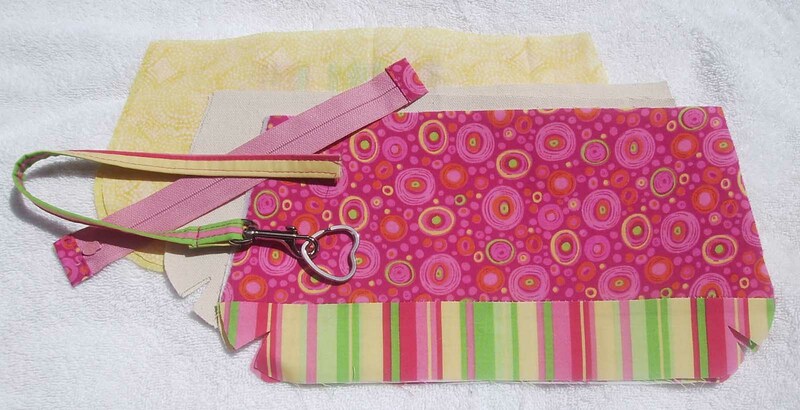 The wristlet itself is a great purchased pattern/tutorial. The instructions are very clear. I won’t kid you though, this is actually a tough one to sew. Really. The zipper top is a great finish, but I had difficulty turning it right side out and fixing the zipper ends in the install. 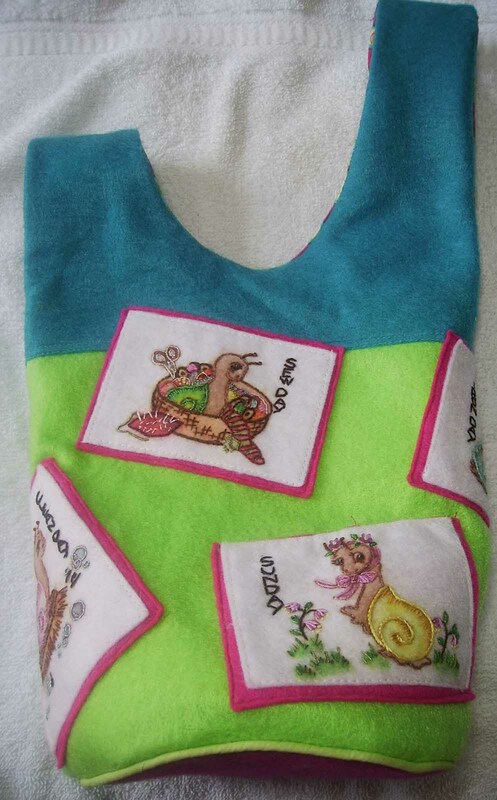 It is my first one, but I’m not new to sewing, so I was surprised that I had as much difficulty with it as I did. It’s made from 4 layers of fabric! 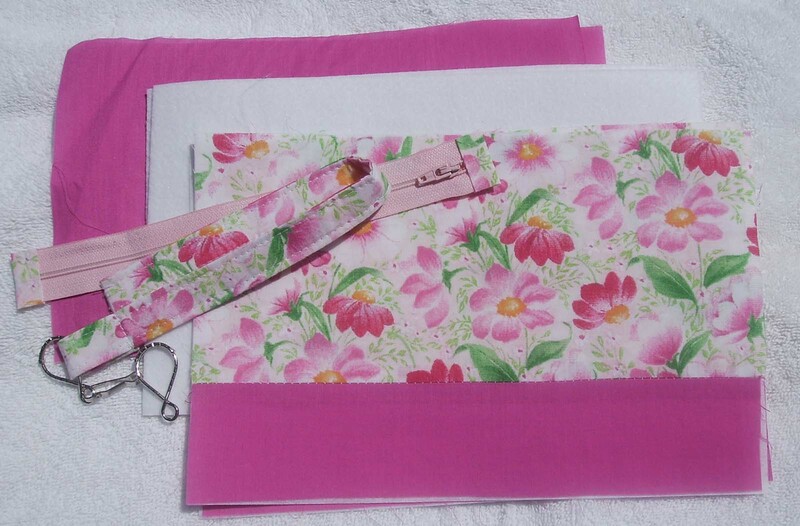 This wristlet uses cotton fabric for the main fabric and lining. 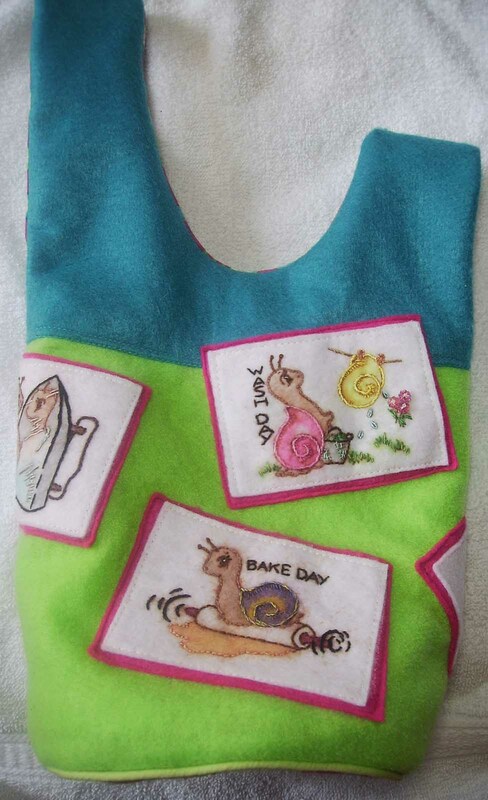 It is interfaced with fusible lightweight pellon and I used a fusible fleece for the interlining. 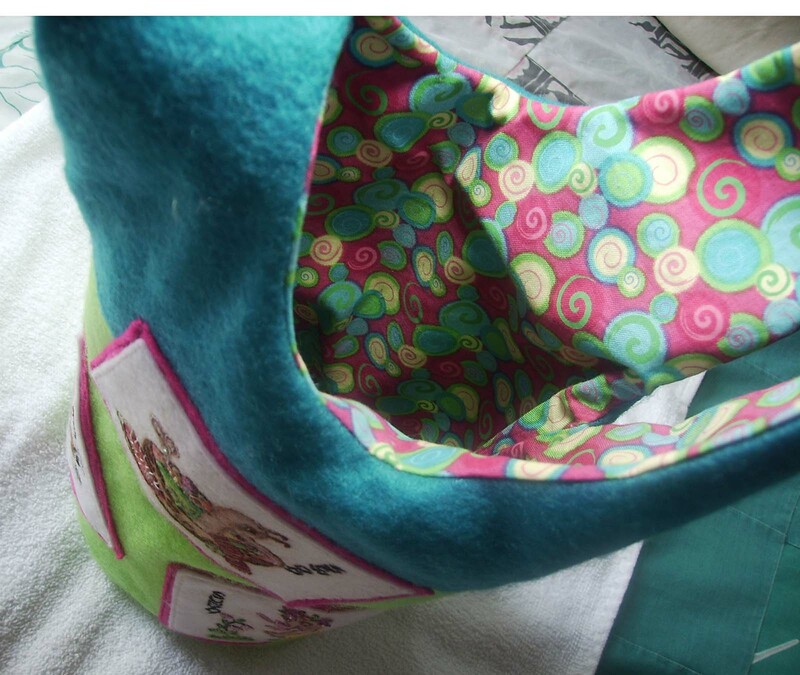 This little purse packs a LOT of fabric and has great heft. It feels really sturdy, not stiff…sturdy. It’s cute, compact and feels good to hold on to. 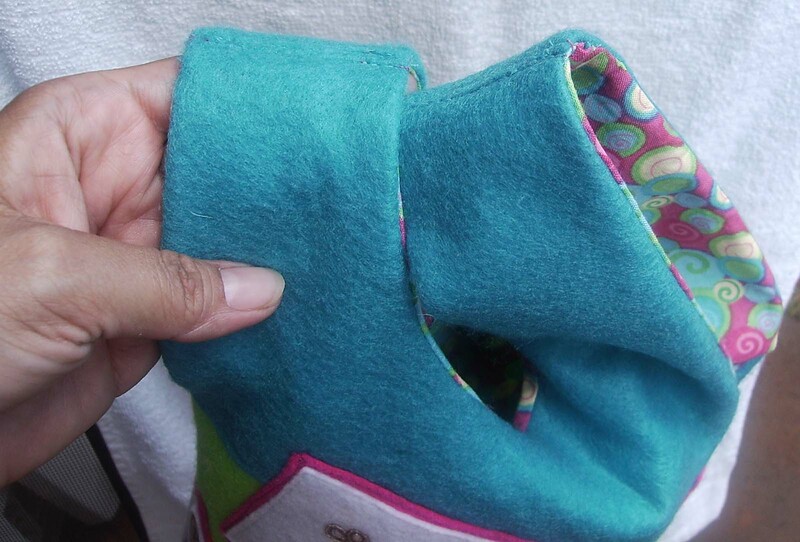 and the wristlet handle connects to the zipper to double as a zipper pull. It was fun to embroider and fun to prep. There were some hard struggles with the construction, but overall the project is a success! Now, I wonder if it is a salable item? A few days back I discovered a “new to me” blog, Oh Fransson. There I watched a few daily wristlets being created and my mind started whirling…thinking of how I could use these wristlets as canvases for embroidery. I just couldn’t decide which style of her 3 to create, so I am trying one of each in the larger sizes. I followed her directions, cut out the solid colored fabric for the wristlets, then stared at it a bit and decided I needed to mix it up a little. 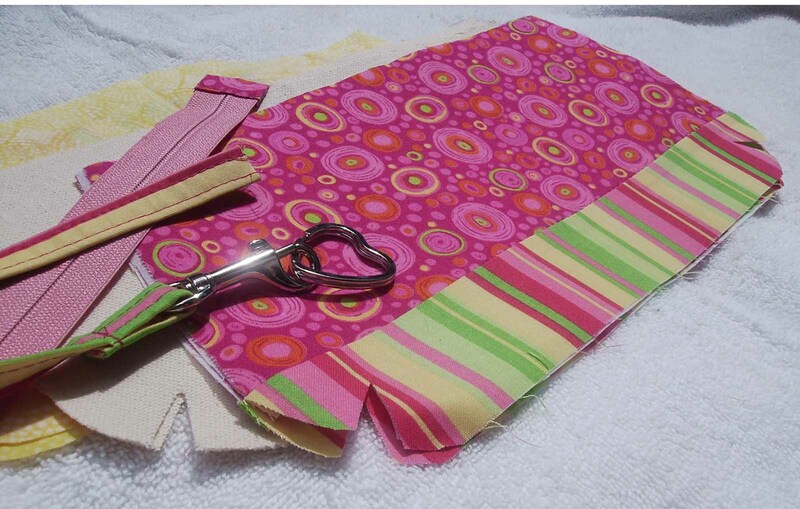 I spliced other fabric onto the main bodies and created a second color ‘base’ for each wristlet. 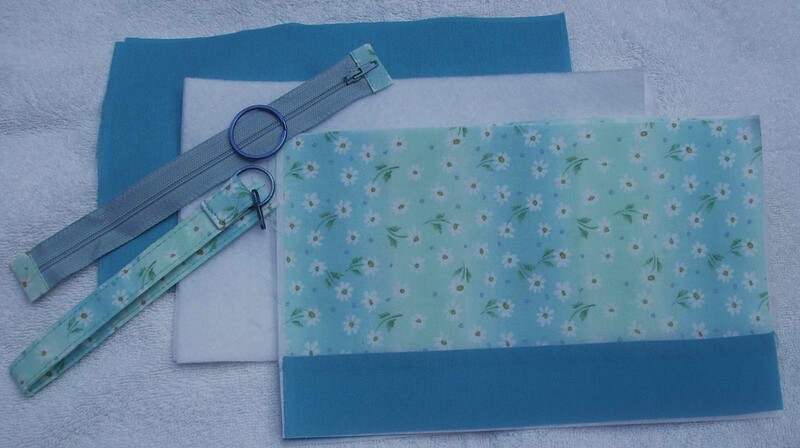 Each wristlet has been prepped for finishing. The lining, interlining, interfacing, main fabric has all been correlated. 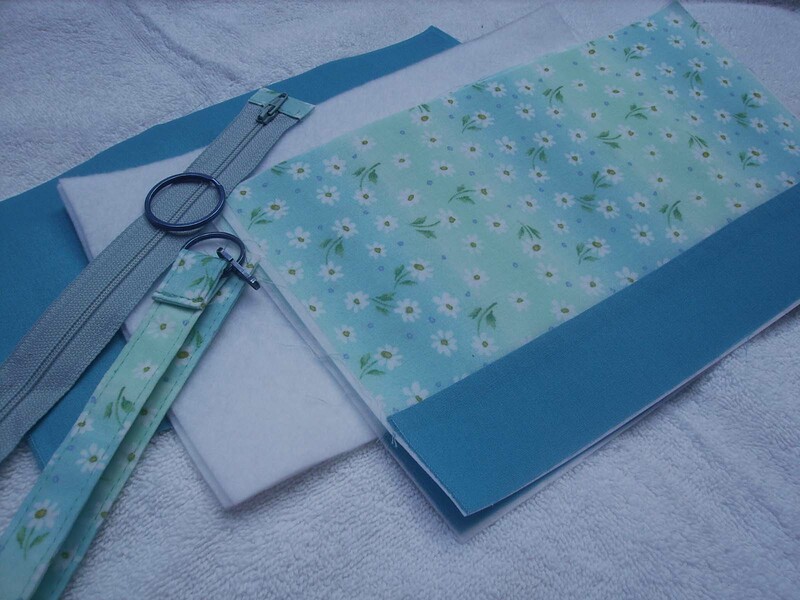 The pocket is sewn in place in the lining, the zippers are prepped, the straps are ready and waiting. Now…all they need are some embroidery embellishments. I see an elf watering these flowers. What do you see here? Any ideas? I see maybe…a…fairy touching the flowers here. What do you see? Suggestions? Maybe a retro cat? Ideas? I am at a stopping point now. Wondering what to add to these cute little bags. 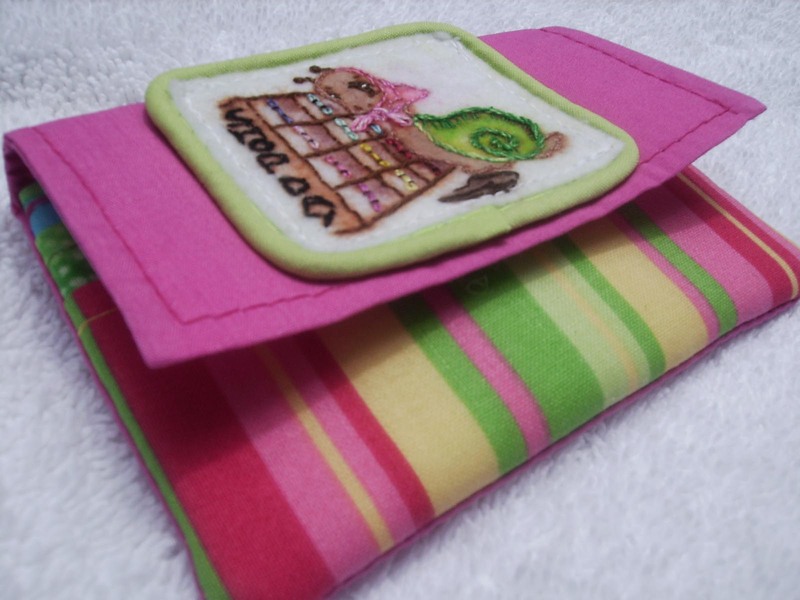 This little wallet is made from a Lazy Girl Designs pattern, Wonder Wallet. 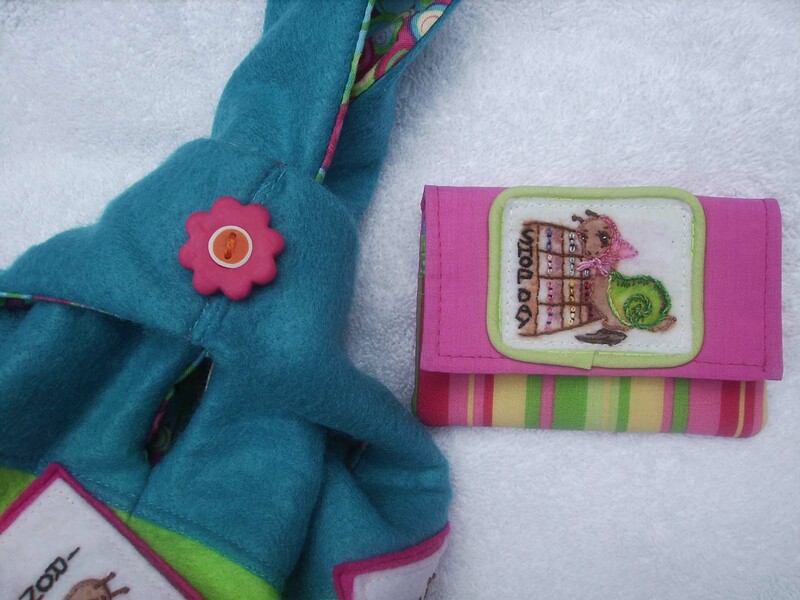 We took the same fabric from the lining of the Snail Purse and used it as one of the top pockets and accent piece for the little matching wallet. 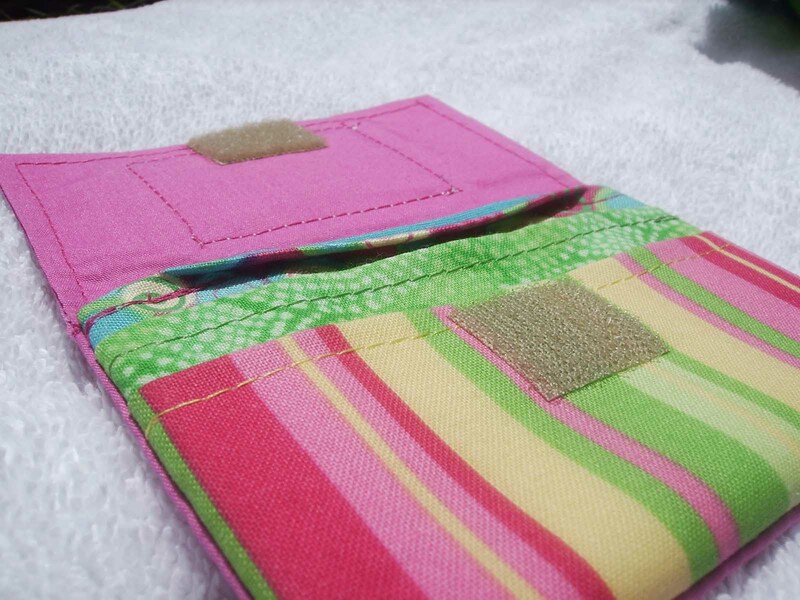 The wild stripe really went well with all the colors and makes the wallet a little fun and crazy! Notice the velcro closure. It’s Fabric Fushion Velcro. It IRONS-on. No sewing. NO. NOPE. NO. 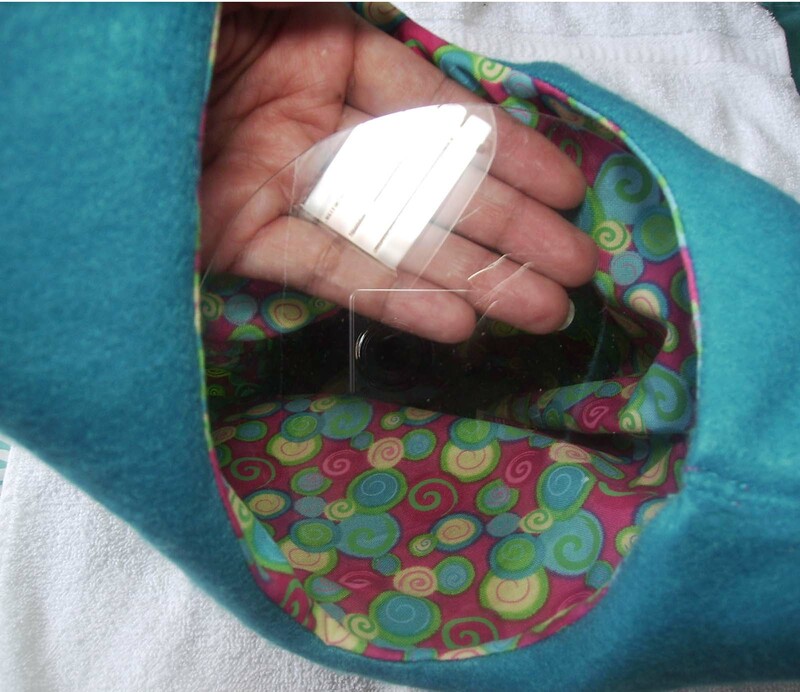 No sewing velcro…whoo hoo! [“Shop Day” snail was made the same way as all the other Snail Portraits. She’s just a little smaller.] 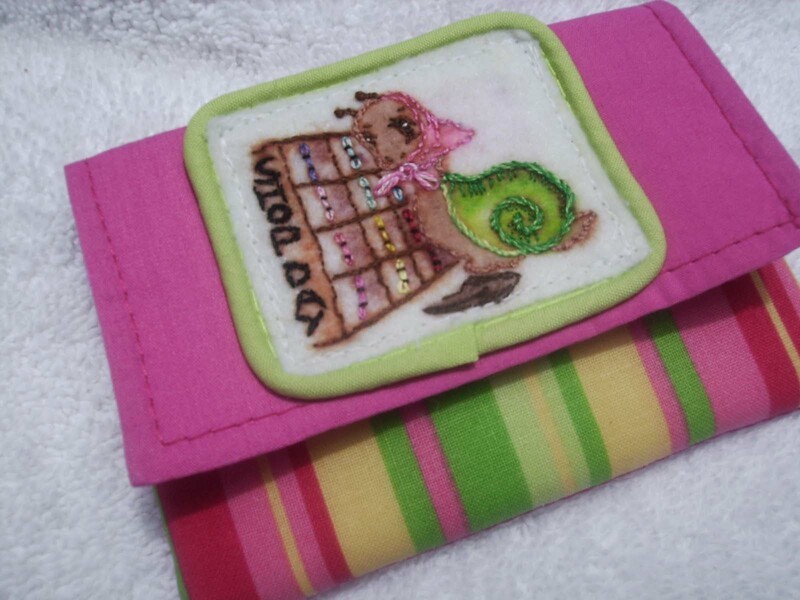 Here’s little “Shop Day” snail appropriately placed on the wallet for shopping. I altered her design. The original has her shopping for vegetables and milk. I just couldn’t find a lot of FUN in shopping for vegies or milk…so I have her shopping…where else? At the Local Yarn/Needlecraft Store! Can you see what she is browsing through? The snail patch is very, very little. It’s only 1.5″ x 2″. Here you can see, the wallet just fits in my hand. 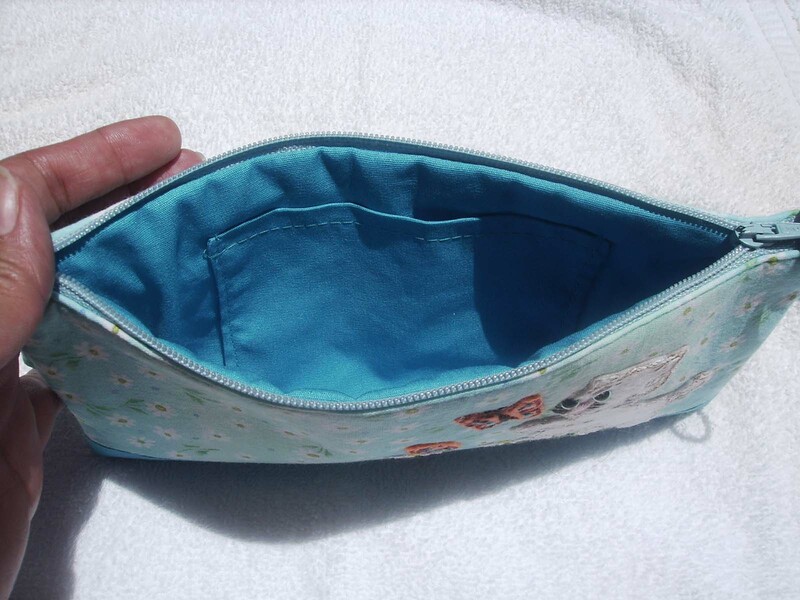 According to Lazy Girl Designs, you can stuff this puppy of a wallet pretty full…I’m sure going to try! 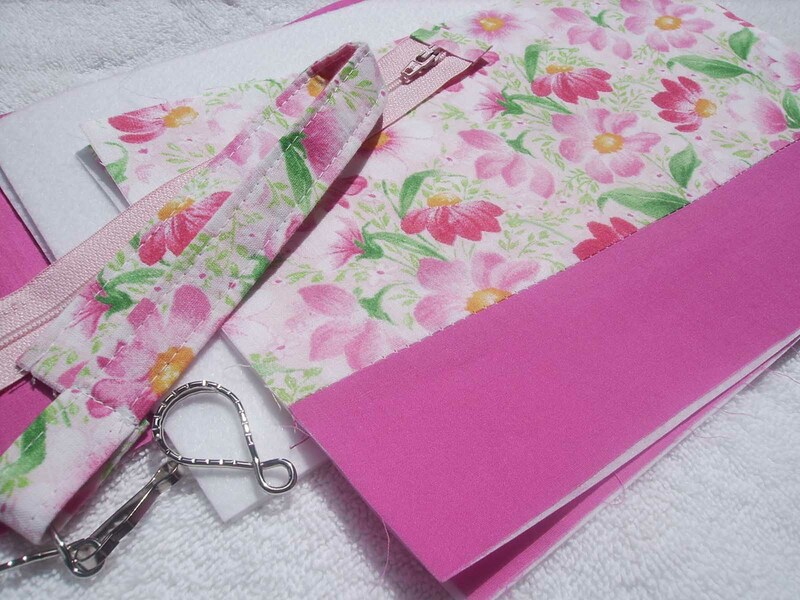 While finishing the wallet, a cute little bright pink flower button was added to the short handle strap of the finished Snail Purse. Now all the pink ties all the elements together…and the Snails are a full “Days of the Week” pattern with 7 complete portraits. 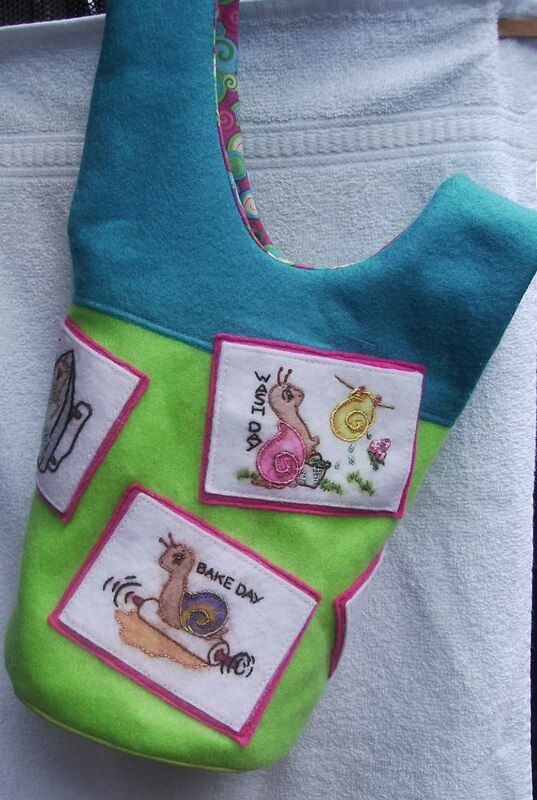 How does the “Shop Day” wallet fit with the little Snail Purse? Well…let’s look! 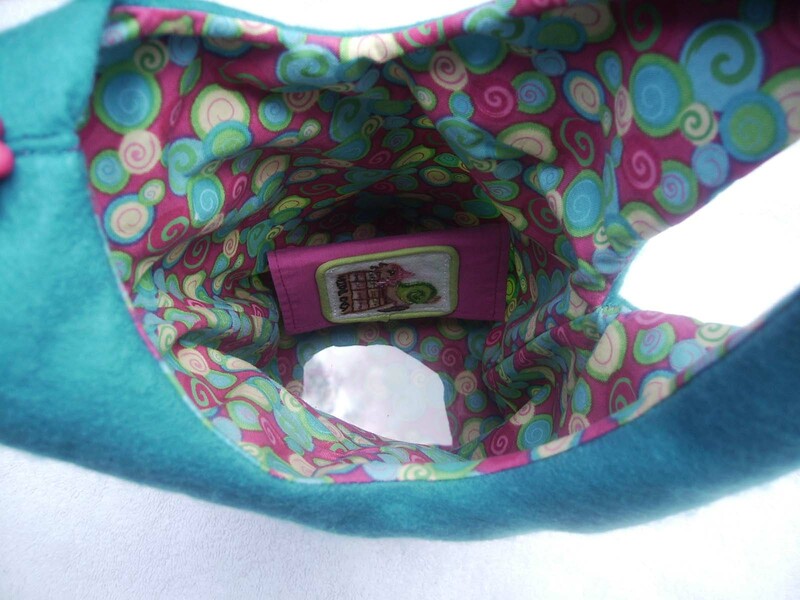 Here is the bottom of the Snail Purse…see the little wallet down there? You can see the reflection off the plexi glass bottom and guess that there is actually a lot of room down there for more stuff! Here’s proof. 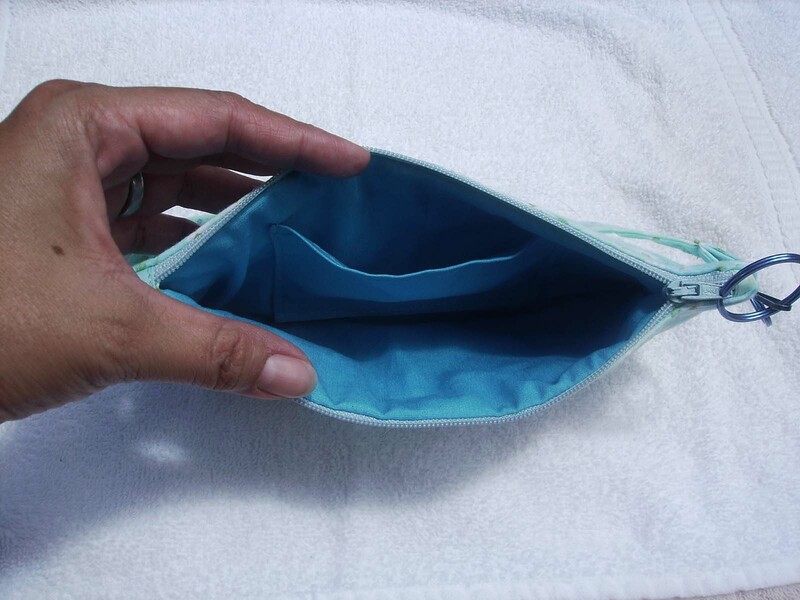 My hand is down there with my hand under the wallet. You can put a LOT of stuff in this purse! 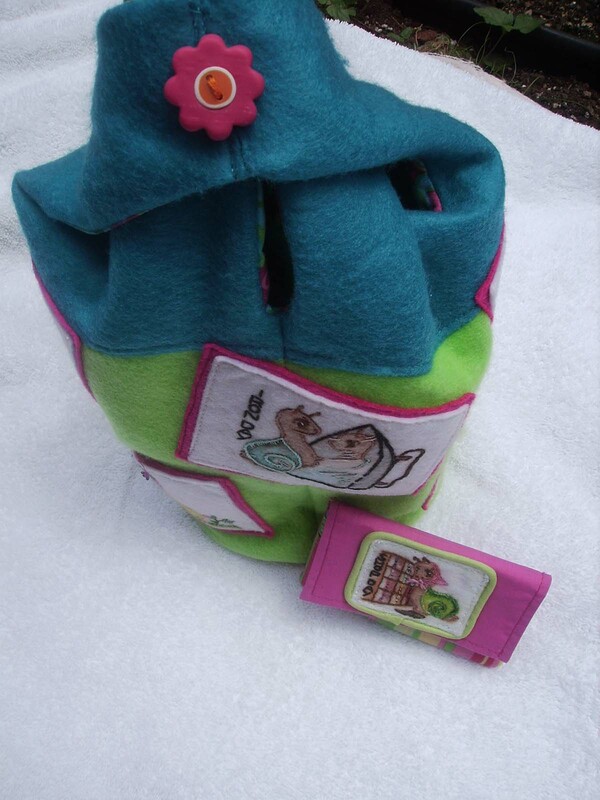 And…here is the Snail Purse, wallet snug inside, handles all ready to go on an adventure! Try a wallet! 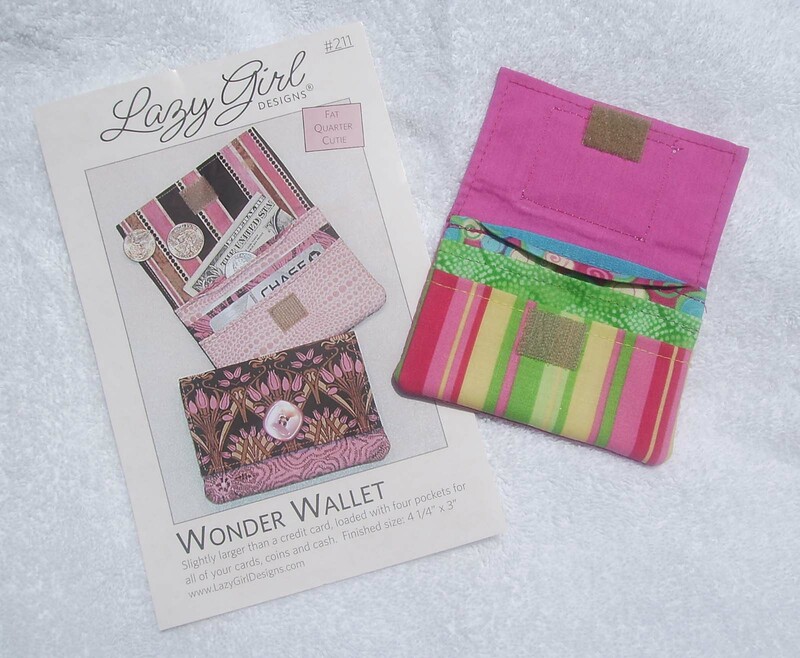 The Lazy Girl Wonder Wallet pattern is EASY PEASY. Really. It really is. 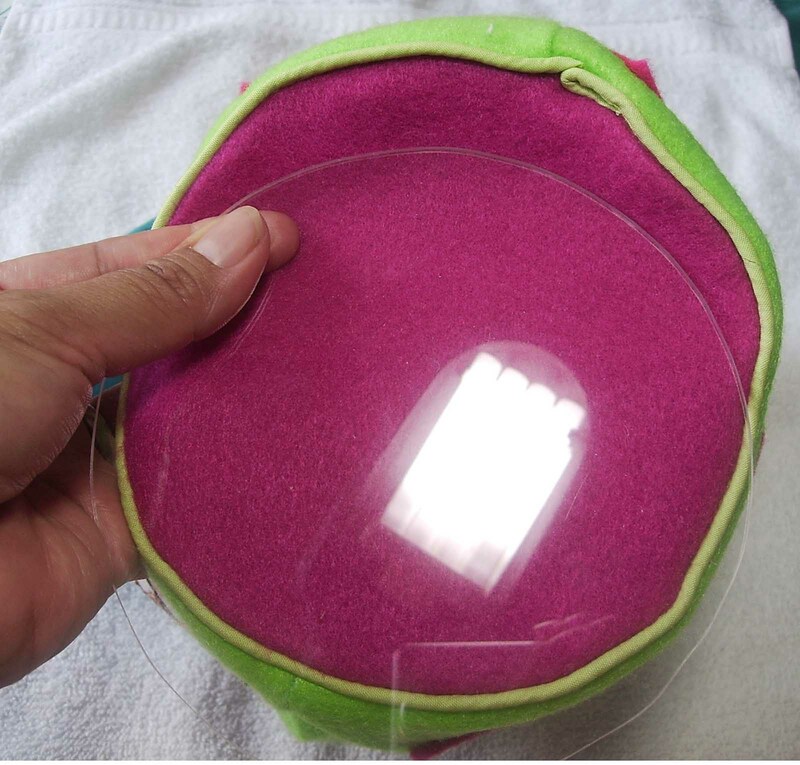 All the parts can be cut with a rotary cutter and the directions are beautifully clear with illustrations and clear, precise instructions. 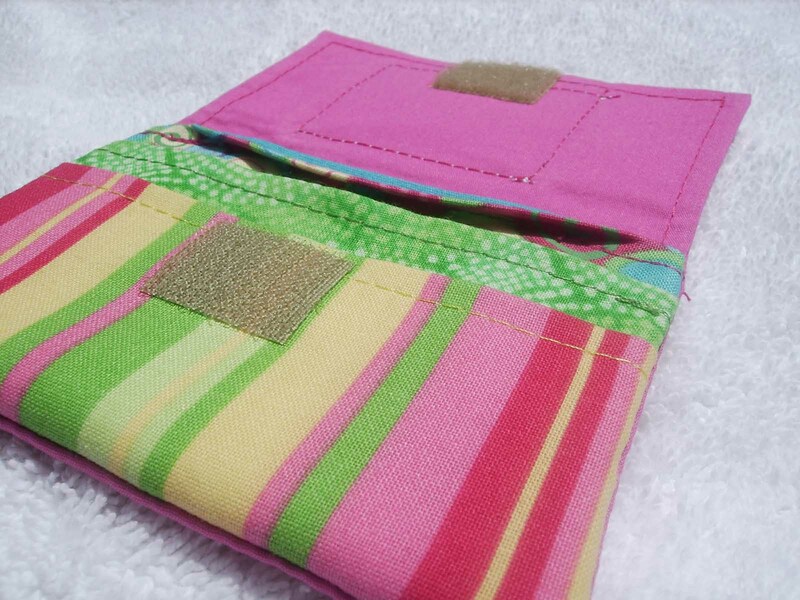 Best of all, the wallet can be made from wonderful scraps! 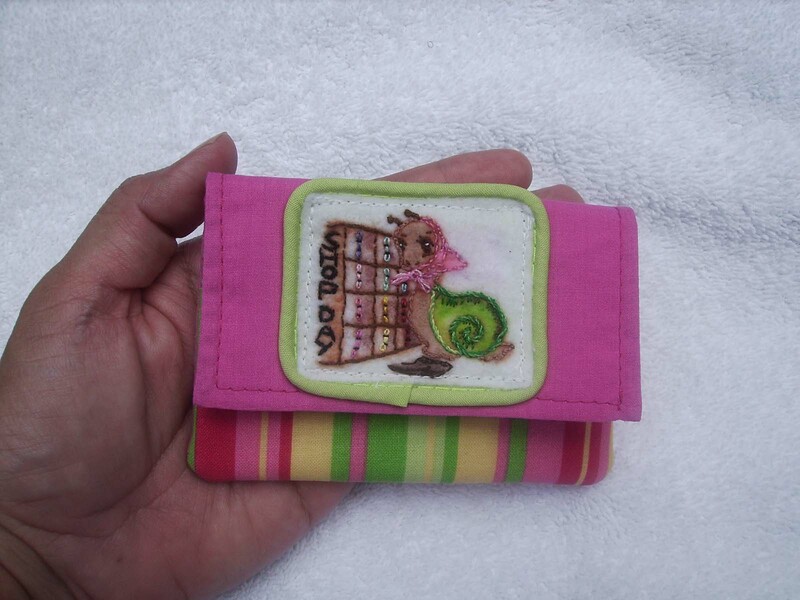 I can see all types of embroidery projects adorning this little wallet. 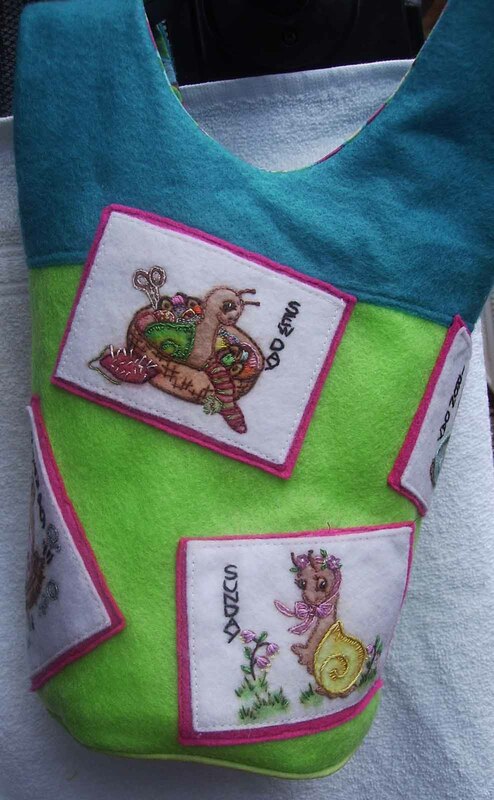 You’ve got a flap, a back, pockets to embellish…oh, and crazy quilters…can you SEE it?! 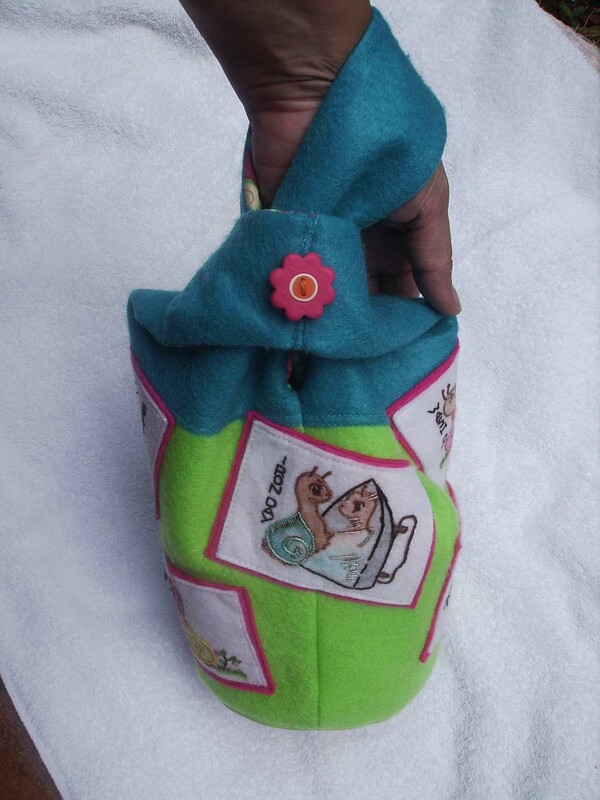 This little guy is a quick little, affordable gift for anyone of any age! 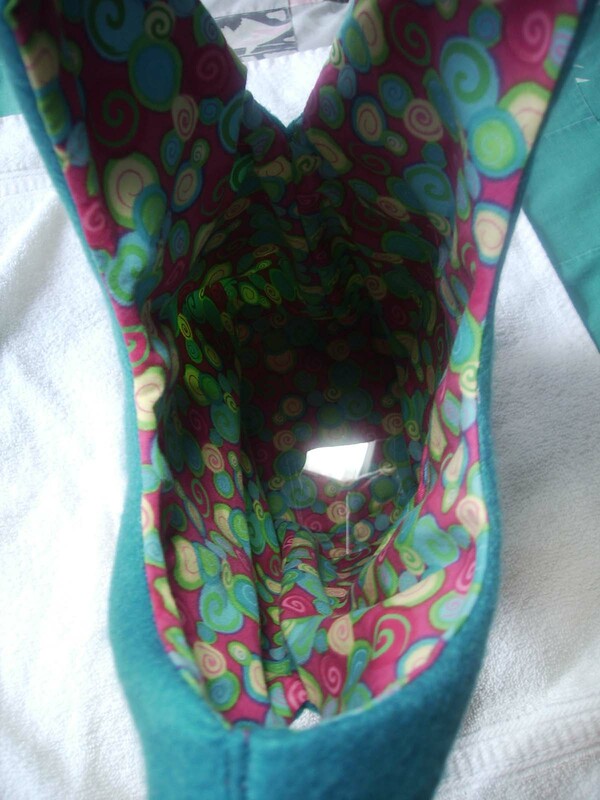 I added a plexi-glass bottom to the purse. [I cut it out on the bandsaw ;)] It keep the bottom firm and all my little ‘junk’ won’t sag into oblivion. 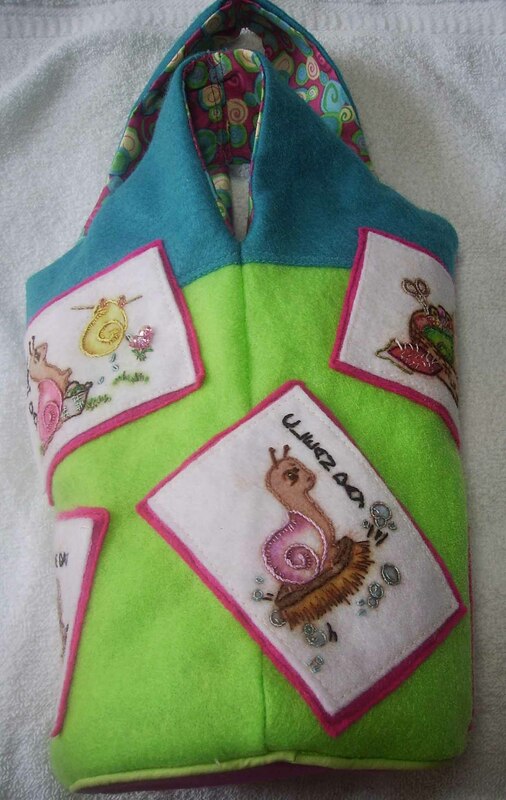 Here is the Gallery for the completed Snail Purse/Bag! Enjoy!